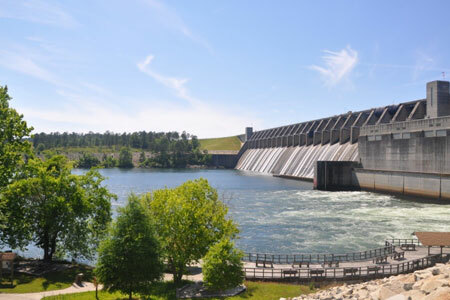 The U.S. Army Corps of Engineers' Clark Hill Dam and Lake, now J. Strom Thurmond Dam and Lake, is a man-made lake bordering Georgia and South Carolina. The lake is located on the Savannah River 22 miles above Augusta, Georgia, and 239.5 miles above the mouth of the Savannah River. At full pool elevation, the lake comprises nearly 71,100 acres of water and 1,200 miles of shoreline. The project was designed for flood control, hydropower, fish and wildlife, water quality, water supply, downstream navigation and recreation. It's one of the top ten most-visited Corps lakes in the nation.